In this tutorial for JungleDocs for Office 365 you will learn 4 ways to open the app, in both classic and modern view. Note: if you're opening the app for the first time, we recommend option 1 or 2. With JungleDocs for Office 365, you can use the metadata stored in your lists to create new list items or documents. When you are using JungleDocs for the first time, we recommend you to choose this option. You can use JungleDocs for Office 365 to extract specific metadata from a list item, to create a new list item or to add the selected metadata to a document. In this way, you can create one or more new list items that contain a Company name and the Company's phone number. To achieve this you would select the list items you want to use, and then open JungleDocs and run a New & From Existing rule. If you want to use list items to create documents or new list items, open a list and select one or multiple items that you want to use in JungleDocs 365. Once you have done that, open JungleDocs 365 from the menu bar. If you want to use list items to create documents or new list items in SharePoint's classic view, open a list and select one or multiple items that you want to use in JungleDocs. Now open JungleDocs from the ribbon. With JungleDocs for Office 365, you can update your existing documents, copy them and change the metadata or merge them. You would do this by selecting the documents you want to use and opening JungleDocs from the ribbon. Select documents to use with JungleDocs in Classic View and open the app from the ribbon. In the same way, you can select documents to use in Modern View. You can also just open JungleDocs straight from the ribbon without selecting any documents or items. You can also just open JungleDocs straight from the ribbon in Classic View without selecting any documents or items. This method is not recommended when you are opening the app for the first time (on a new site). The reason we recommend option 1 or 2 over 3, is that JungleDocs would not know which library it should start creating your documents or items in. 1. 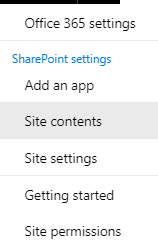 Open your SharePoint site contents. 2. Find JungleDocs and open the app.